244 pages | 29 B/W Illus. Laura Price is a feminist cultural geographer. 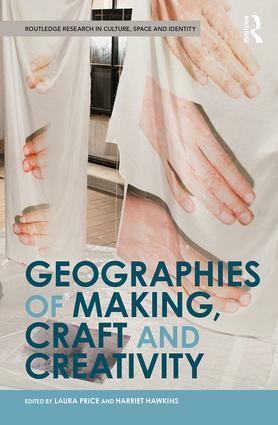 Her PhD thesis explored the geographies of knitting, gendered creativity and the role of materials in everyday lives. She is currently a writer of education resources at the Royal Geographical Society (with the Institute of British Geographers) where she works with universities, schools and teachers to promote and share geographical learning. She is co-editor of Geographies of Comfort (Routledge, 2018). Harriet Hawkins is based in the Department of Geography, Royal Holloway, University of London where she works on the geography of art works and art worlds. She is committed to practice-based research and collaboration with artists and arts institutions and organisations. She is author of For Creative Geographies (Routledge, 2013) and Creativity: Live, Work, Create (Routledge, 2016), editor of cultural geographies and founder and co-Director of Royal Holloway, Centre for the GeoHumanities, where she is currently Professor of GeoHumanities.